Bayern Munich winger Arjen Robben was surprised by Real Madrid's cautious approach to the first leg of their Champions League semi-final in Madrid. Despite Robben's former club winning 1-0 at the Bernabeu, defending champions Bayern enjoyed 72% possession. "I expected more from Real," said ex-Chelsea forward Robben. "I expected them to come storming out of the gates, but instead they waited and allowed us to run the game. That surprised me." Karim Benzema scored the only goal of the game but Mario Gotze and Thomas Muller both had excellent chances to equalise late on for Pep Guardiola's side, who lacked a cutting edge. Real were also wasteful in front of goal, with Cristiano Ronaldo and Angel Di Maria both spurning good chances. 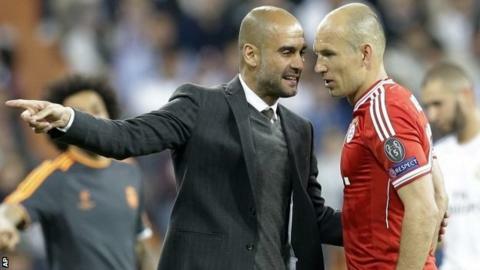 "I'm proud of my team," said Bayern's ex-Barcelona coach Guardiola. "They showed a lot of strength against one of the best teams in the world. I think that we can still crank up a gear or two in the return leg. "We wanted to have a lot of possession and have a quick transition from defence to attack. We controlled the game, but Madrid were waiting to counter-attack and they have the players to take advantage of this." The return leg takes place on Tuesday at the Allianz Arena, where Bayern have lost only twice this season. They were beaten 3-2 by Manchester City in the Champions League in December before Borussia Dortmund secured a 3-0 Bundesliga victory earlier this month. Guardiola added: "My optimism is still very high. It's even higher than it was before this game." Real coach Carlo Ancelotti, who could only call on Gareth Bale as a late substitute given the player had been suffering with flu, was satisfied with his team's performance. "I'm happy with everything, because the match was difficult," he said. "We played well, suffering sometimes and playing well in attack. "Without Gareth Bale and with Cristiano Ronaldo at 50%, it was not easy. The team worked well. Cristiano made an effort to play. "The second leg is very difficult; we have a small advantage but we have to play with the same confidence and desire as we showed today. Nobody knows what can happen in Munich."